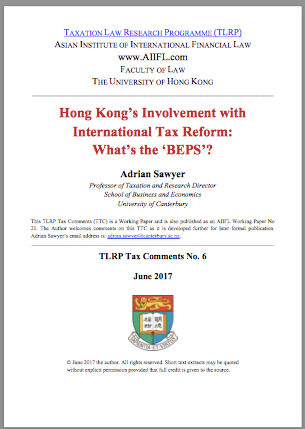 "Hong Kong's Involvement with International Tax Reform: What's the 'BEPS'?" Abstract: The Hong Kong Special Administrative Region (HKSAR) was initially a reluctant participant in major international tax reforms initiated by the OECD, including (automatic) exchange of information (AEOI). In more recent times, as outlined in an earlier paper by the author, the HKSAR has become an active participant working at the forefront of the Base Erosion and Profit Shifting (BEPS) initiatives, including being part of the ad hoc group that developed a multilateral instrument under BEPS Action 15. This paper provides a forward-looking overview of BEPS, outlines the HKSAR’s engagement with BEPS and international tax reform, and offer some thoughts on where BEPS may take us. Author: Dr Adrian Sawyer is Professor of Taxation, and Research Director for the School of Business and Economics, at the University of Canterbury, Private Bag 4800, Christchurch, NZ. This paper draws upon earlier work by the author while he was a visitor hosted by the Asian Institute of International Financial Law (AIIFL) and Taxation Law Research Programme (TLRP) at the University of Hong Kong. This TLRP Tax Comments (TTC) is a Working Paper and is also published as an AIIFL Working Paper No 21. The Author welcomes comments on this TTC as it is developed further for later formal publication. Adrian Sawyer’s email address is: adrian.sawyer@canterbury.ac.nz. Please download the paper from here.